At Carter Legal Services, P.A., my mission is to learn and understand my clients' needs and the external factors affecting them so that I can aggressively and professionally represent them throughout the legal process. I clearly communicate my legal knowledge and experience, thereby enabling my clients to make well-informed decisions for themselves. 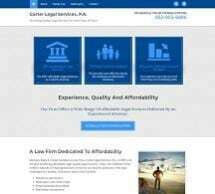 At Carter Legal Services, P.A., I am constantly seeking to improve my performance in order to be prepared for the challenges facing my clients. I keep pace with the latest innovations in the delivery of legal services by continually investing in training and technology. My work environment is based on diligent work effort, community involvement and a commitment to the profession.